Living to 100 is easier than you might think. Surprising new research suggests that even people who develop heart disease or diabetes late in life have a decent shot at reaching the century mark. "It has been generally assumed that living to 100 years of age was limited to those who had not developed chronic illness," said Dr. William Hall of the University of Rochester. Hall has a theory for how these people could live to that age. In an editorial in Monday's Archives of Internal Medicine, where the study was published, he writes that it might be thanks to doctors who aggressively treat these older folks' health problems, rather than taking an "ageist" approach that assumes they wouldn't benefit. For the study, Boston University researchers did phone interviews and health assessments of more than 500 women and 200 men who had reached 100. They found that roughly two-thirds of them had avoided significant age-related ailments. But the rest, dubbed "survivors," had developed an age-related disease before reaching 85, including high blood pressure, heart disease or diabetes. Yet many functioned remarkably well - nearly as well as their disease-free peers. Overall, the men were functioning better than the women. Nearly three-fourths of the male survivors could bathe and dress themselves, while only about one-third of the women could. The researchers think that may be because the men had to be in exceptional condition to reach 100. "Women, on the other hand, may be better physically and socially adept at living with chronic and often disabling conditions," wrote lead author Dr. Dellara Terry and her colleagues. Rosa McGee is one of the healthy women in the study who managed to avoid chronic disease. Now 104, the retired cook and seamstress is also strikingly lucid. "My living habits are beautiful," McGee said in an interview at her daughter's Chicago apartment. "I don't take any medicines. I don't smoke and I don't drink. Never did anything like that." 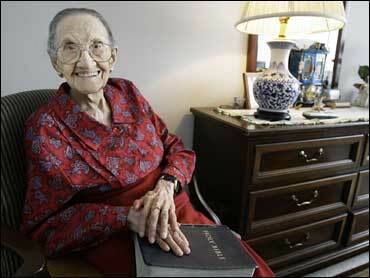 Until late 2006, when she fell in her St. Louis home, McGee lived alone and took care of herself. Now in Chicago, she is less mobile but still takes walks a few times weekly down the apartment building hallways, with her daughter's help. McGee credits her faith in God for her good health. She also gets lots of medical attention - a doctor and nurse make home visits regularly. Genes surely contributed - McGee's maternal grandparents lived to age 100 and 107. But while genes are important, scientists don't think they tell the whole story about longevity. A second, larger study of men in their 70s found that those who avoided smoking, obesity, inactivity, diabetes and high blood pressure greatly improved their chances of living into their 90s. In fact, they had a 54 percent chance of living that long. Their survival decreased with each risk factor, and those with all five had only a 4 percent chance of living into their 90s, according to Harvard University researchers. Those who managed to avoid lifestyle-related ailments also increased their chances of functioning well physically and mentally two decades later. The study followed 2,357 men for about 25 years or until death, starting in their early 70s. About 40 percent survived to at least age 90. Among survivors, 24 percent had none of the five risk factors. "It's not just luck, it's not just genetics. ... It's lifestyle" that seems to make a big difference, said lead author Dr. Laurel Yates of Harvard's Brigham and Women's Hospital. "It's get your shoes on, get out there, and do some exercise," she said. "These are some things you can do" to increase the chances of a long life. Yates said it's never too late to adopt a healthier lifestyle, though the findings don't address whether waiting until age 70 to stop smoking, lose weight and exercise will increase longevity. Hall noted that the United States has more than 55,000 centenarians, and that Americans 85 and older are the country's fastest-growing group of older adults. He said the new research underscores how important it is for doctors to become adept at treating the oldest of the old, who are "becoming the bread and butter of the clinical practice of internal medicine."